IF YOU ARRIVE IN ST KITTS or NEVIS we will meet you at the airport and transport you FREE OF CHARGE to Coral Reef Villa. Coral Reef Villa is the perfect luxury choice for a couple on a honeymoon or romantic vacation or an individual. This is the newest, best equipped, most luxurious villa with the most acreage and spectacular mature tropical gardens of the 4 rental villas in the Nisbet Beach area. The location is very desirable with the property extending to our beautiful white coral sand beach and a short distance to the beach facilities of a small upscale resort and yet privately screened by many types of palms and exotic flowering bushes. You can sit around the large pool or on the huge screened in porch with 2 hammocks, comfortable lounge chairs, large dining area and watch the waves curling on the reefs. The large kitchen has the latest appliances and dishwasher. Washer, dryer, wireless internet, generator are also available. A manager will be available to greet/assist you. Why we have so many repeat guests: Our many repeat guests tell us why they return A) Location: direct access to our family's 3 white coral sand beach lots near pristine coral reefs and with miles of beach to explore with views of St. Kitts. The villa itself on almost an acre of privately screened tropical flowering foliage so although secluded it is still adjacent to a small resort and its beach bar and restaurants and spa. B) Private pool with virtually chlorine free system that is hidden by tropical plants with the perfect amount of sun and shade on the pool deck.C) 'Awesome' 'Amazing ' 'Fantastic' villa and the photos don't do it justice. It's so luxurious, well equipped and yet so comfortable. D) Having Marlon meet them at the airport or ferry and transport them to the villa where the manager waits to greet them and is available during all their stay. Jeannette, the maid has the villa immaculately clean. an A to Z info of things to see and do with names and phone numbers based on 23 fun years on Nevis. A to Z includes airline ideas ( you can now fly in to Nevis directly from San Juan ) and possible airline savings, restaurant guide, rental car recommendations and savings, grocery stores and hours etc. From the spacious screened-in veranda you'll have an unobstructed view of the ocean and it's nearby coral reefs, while dining or relaxing on cushioned chaise lounges or in comfortable wicker chairs or two hammocks. The large modern kitchen is fully equipped including a dishwasher so you can cook a gourmet meat if you prefer to eat in. There is a propane gas grill on the back patio. The laundry room has a washer and dryer. More amenities include cable TV with HBO, DVD and VCR players, Although it's tempting to stay at Coral Reef's beach, or pool or on the porch do take a short walk to enjoy a drink or a meal at the Nisbet Plantation beach facilities. Then explore the island with it's many historical sites ie plantations, forts and museums. Enjoy meeting friendly Nevisians. Have fun watching for monkeys, donkeys. Nevis is a unique island. Nevisians are known for their friendly smiles and welcome to visitors. Nevis is special with only about 12,000 people, no high rise buildings (nothing taller than a palm tree allowed), no large cruise ships, no gambling. CORAL REEF VILLA is at the best location on Nevis .. a few minutes from our beach and next to a boutique 4**** resort at 70 guests max, where you can run a tab at their beach restaurants and bar. GENERATOR ... STATE OF THE ART ... when power goes off just touch red button to start the generator and when government power comes back on it will shut itself off. Another wonderful stay at Coral Reef and Nevis. And thanks to Jane for making us feel right at home in a beautiful setting. What a lovely, relaxing, quiet Oasis. Jane Paul is very attentive and wants you to have a wonderful experience. It was just the right amount of things to do and a step away from the real world. We lived on the back porch staring at the ocean waves breaking on the reef. Food at all restaurants was great and the atmosphere matched. Many of us don't like going back to the same places but this one might stay on the list. The Coral Reef Villa is the very best place to stay! There are so many places to relax in the home, my wife and I would ask each other where should we sit to eat breakfast (or lunch or dinner)? There is the breakfast bar, dining table, or the screened in porch with the ocean view which was our choice most of the time. We were going to go to the botanical gardens on the island but we did not because the property is like a botanical garden itself. The Nisbet Beach Resort is just a couple minutes walk away on the beach, we enjoyed their lunches and Thursday night buffet barbeque. They made us feel just as welcome as their guests. All of the services that Jane suggested were top notch. Marlin with the car rental and island tour, Dennis Small for fishing with a world class fishing boat, and on and on. Jane made sure we had everything we needed. Housekeeping, pool, and property very well kept. We did not see a property anywhere on the island that we would have rather stayed. Even though we were right next to Nisbet Beach Resort, it still was very private. Monkeys passed through the yard on occasion, birds, flowers, volcano view in the back yard, this place has everything! We really loved and recommend this property! We like to go some place different every year, but are definitely considering going back here. An idyllic location, and the hospitality offered by Jane Paul is unsurpassed. She knows this island, and it is a great island for relaxing and getting away from it all. People on this island are wondreful, happy, and helpful, so there is nothing to worry about. Nisbet Beach area is away from the hustle and bustle of any town and it's always with a happy feeling of homecoming to return to our special spectacular ocean views and refreshing breeze. The trade wind breezes are a special blessing in the Caribbean where they almost constantly blow and have a cooling effect which off sets the average temperature in Nevis which is usually in the low to mid 80's. 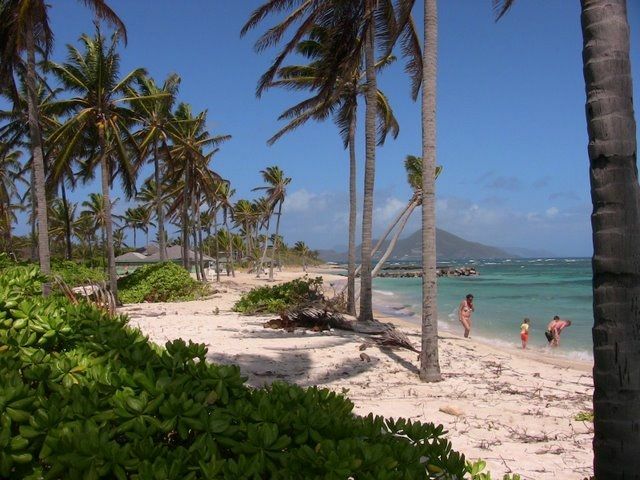 The trade winds keep the palm fronds rustling and swaying and are a soothing feature, especially on our side of Nevis which is in the perfect location to get the maximum benefit from the trade winds coming from the North East. No need for anything other than quality ceiling fans and a dip in the pool or sea where the temperature stays about 82 degrees.